Figure 9.10. Overview of Hevylite kit manufacture. Figure 9.11. 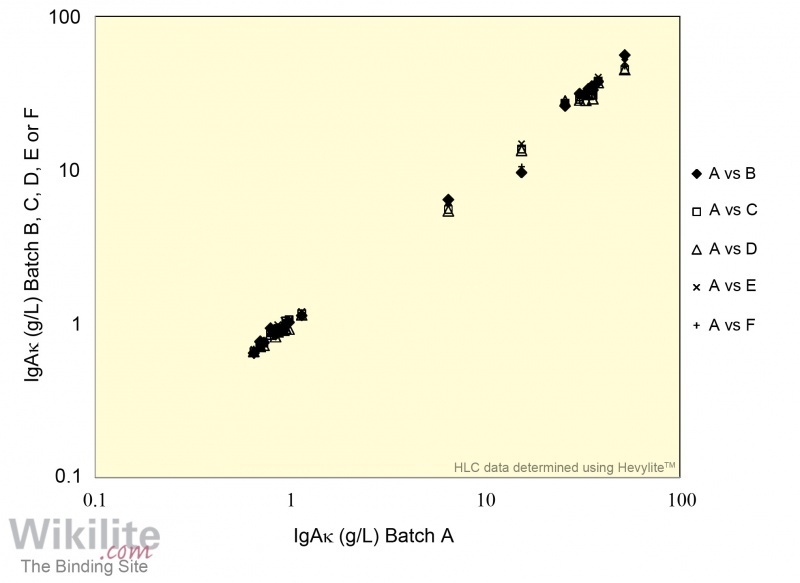 Batch-to-batch analysis for IgAκ HLC. Six IgAκ batches were compared using an in-house quality control panel. In each analysis, values obtained from a predicate batch (A) were compared with values from five separate batches (B to F). The manufacture of Hevylite assays follows established, validated protocols, and each batch of reagents undergoes rigorous testing to ensure the quality of the kits (Figure 9.10). Once all the raw materials for a kit have been manufactured the curve performance and antigen excess capacity of the reagents are evaluated. Values are then assigned to the kit calibrator(s) and controls using the internal reference standard. Specificity is evaluated by testing panel samples. HLC results for each new batch of antisera are compared with assigned values and results from previous batches. The panel samples include normal sera and patient sera containing polyclonal or monoclonal immunoglobulins (typically from patients with multiple myeloma or Waldenström’s macroglobulinaemia). The results are compared using Passing-Bablok analysis and are considered acceptable when they fall within a defined set of criteria. Typical batch-to-batch comparison data on the Binding Site SPAPLUS is shown in Figure 9.11..
Assay calibration and kit performance are also controlled by analysing large numbers of normal sera. The results are compared with the normal ranges defined in the product insert (Chapter 10). The results are also summated and compared with the relevant total immunoglobulin assay by Passing-Bablok analysis. The linearity of the kit is evaluated by assaying dilutions of a polyclonal fluid, then once a final pre-packaging test is complete, the kit is packaged, ready for release.